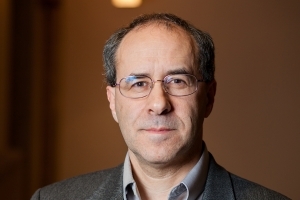 Michael A. Rosenthal is the Samuel & Althea Stroum Chair in Jewish Studies at the University of Washington. He received his Bachelor’s degree from Stanford University and both his Master’s and doctorate degrees in philosophy from the University of Chicago. Before arriving in Seattle, he taught at Grinnell College in Iowa. He teaches and publishes in the areas of early modern philosophy, ethics, political philosophy, and Jewish philosophy. His current research focuses on the philosophy of Benedict Spinoza. His teaching specialties include Spinoza and Jewish philosophy. Rosenthal, Michael A. “Spinoza on Circumcision and Ceremonies.” Modern Judaism (2016), Volume 36 (1): 42-66. Rosenthal, Michael A. “Politics and Ethics in Spinoza: The Problem of Normativity.” In Essays on Spinoza’s Ethical Theory, edited by Matt Kisner and Andrew Youpa, 85-101. Oxford: Oxford University Press, 2014. Gray, Richard T., Halmi, Nicholas, Handwerk, Gary J., Rosenthal, Michael A., and Vieweg, Klaus, eds. Inventions of the Imagination: Romanticism and Beyond, Seattle: University of Washington Press, 2011. Melamed, Yitzhak Y. and Rosenthal, Michael A., eds., Spinoza’s Theological-Political Treatise: A Critical Guide, Cambridge: Cambridge University Press, 2010.